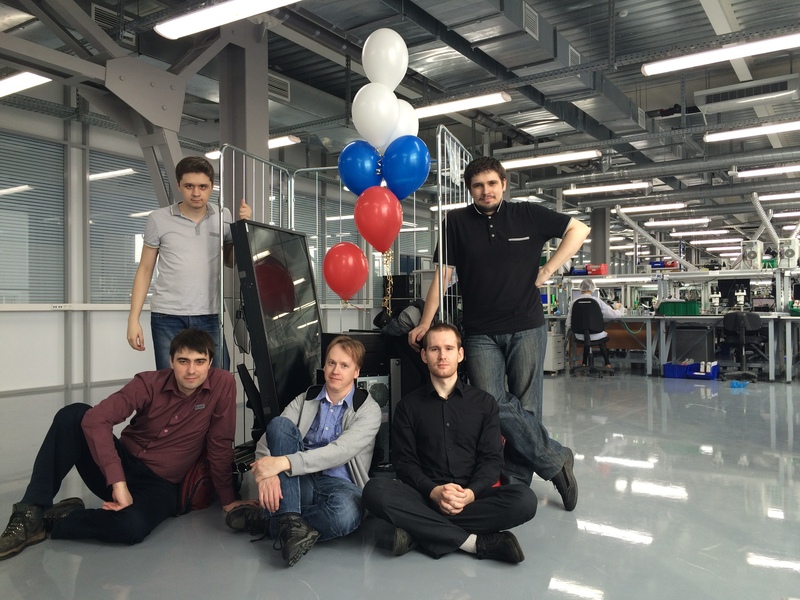 The Opening Ceremony of MICRAN’s new electronic facilities factory took place March, 25 2015 in Tomsk (Siberia). Triaxes specialists took active part in preparing, organizing and maintaining the most showy part of the ceremony that gathered a great number of spectators, among them: the governor of the Tomsk region, mayor of Tomsk, CEO of MICRAN and other VIPs of the town. Regarding the specificity of the show Triaxes specialists decided to diverge from the traditional ribbon snip. According to the more modern scenario created by our specialists the new factory was to be opened by pressing a virtual button. We thought it would be interesting to involve new technologies and build sort of a “bridge” between the real world and the virtual one. Our idea was the following: participants of the show interact with a 3D image on an autostereoscopic display. The human hand penetrates into the 3D space and controls virtual objects. We used the noncontacting control technology allowing to capture hand motions and interact with the computer (in our case – with a 3D display). The main peculiarity of the interaction pattern (Fig. 1.) 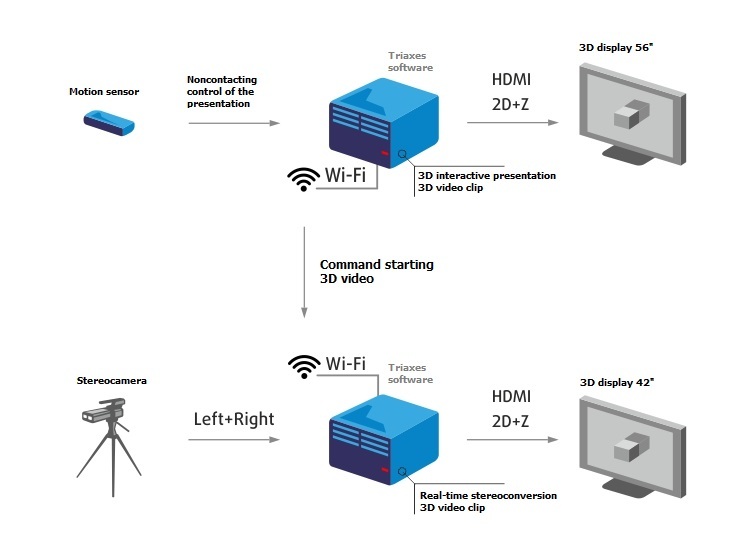 is that the viewer sees the 3D world and communicates with it naturally without having to wear or take special devices. Reaching the sensor sensitivity zone in front of the 3D display, the master of ceremonies sees his/her avatar, i.e. the continuation of his/her hand in the virtual world, presses the play button in the artificial 3D world and starts the video presentation about the new factory (the video was prepared by specialists of Triaxes video conversion studio). Thanks to the interesting idea and teamwork of Triaxes specialists the Opening Ceremony became a significant event in the life of the town and attracted great attention of the audience. Here’s the video on how we organized the whole ceremony. We recommend you to watch it on Youtube with the English subtitles switched on.